This is not one of my usual post-trip posts. If you follow along on our family adventures, you’re used to hearing epic stories of family vs. nature…big bad storms and clouds of biting bugs, wading through ice-cold swollen rivers and marathon portages. This is NOT one of those stories. I’m not one to gush, and I always give the straight story, so believe me when I say that our trip to 1000 Islands National Park last week was perhaps the best family trip that we have ever taken. The fairy tale trip goes something like this…Once upon a time (namely last Saturday morning) in the most charming town of Gananoque (side note: I loved this town so much, I want to move here. Anyway, back to the story) began the vacation of all vacations. We checked into the gorgeous stone home of 1000 Islands Kayaking, the company that was going to be taking us on a tour of this BEAUTIFUL area of Ontario. All the staff that we had contact with were funny and personable and helpful. We bought a parking pass at the local marina for a whopping $6 a day, got set up with drybags for the gear we’d be bringing and headed out for a lesson on kayaking 101. The weather was perfect…sunny and not too hot, not too cold. It was hard to believe that we were on a trip and it wasn’t raining! I’d also like to note that all of our trusty steeds (the boats, pfd’s and drybags) looked brand new and were in mint condition. After shoving off from the dock, Scott (owner and our guide for the day) had us play a game of ball tag in order to get the hang of controlling our boats. It was ingenious and hilarious and it broke the ice with all of the participants. I could go on and on, but let me just hit the highlights instead…we paddled over a sunken ship, into an outdoor chapel in Half Moon Bay that still holds services on Sunday afternoons and heard stories about whatever cottage, island, channel and bird that struck our interest. Scott and all of the guides have an arsenal of history on the area not to be rivaled. It was so much fun and so interesting, the time just flew by. We parked our rides on an island and hiked around exploring while Scott put together a dreamy lunch feast of assorted meats, cheeses, fruit, veggies and juices. A quick online form submitted before the trip allows the guide to tailor the menu to accommodate any dietary restrictions. Total class act. After lunch we hit some bigger water and it was like a roller coaster ride complete with squealing and face-cramping grins. It was all over far too soon. We were escorted over to McDonald Island where we were staying for the next couple of nights and waved goodbye to the rest of the crew. The boats however, stayed with us. 1000 Island Kayaking not only offers tours, courses, certifications and camps, but also just plain up rentals for those lone wolves that like to explore solo. I’ve got to say though, the tour should not be missed. To top it all off, when we got home, we got an email with a link to pictures that Scott took throughout the day, which meant that I was actually in one of our trip pictures! photo courtesy of 1000 Islands Kayaking! Next? How about we didn’t have to set up camp! Our castle awaited us in the form of an oTENTik tent/cabin. It was getting muggy outside but there are tons of windows that can be used with just screens and the breeze off the water kept us perfectly comfortable. This is no B&B and is quite a rustic structure, but beds with mattresses and a table and chairs inside are camp luxuries. A small solar panel also powers up a battery inside that runs a light when necessary. This park without doubt and without exception, has the cleanest bathrooms of any park we have ever visited. Not fancy…no running water, no showers, no flush toilets, but clean composting toilets and a hand sanitizer dispensor in each and every one. 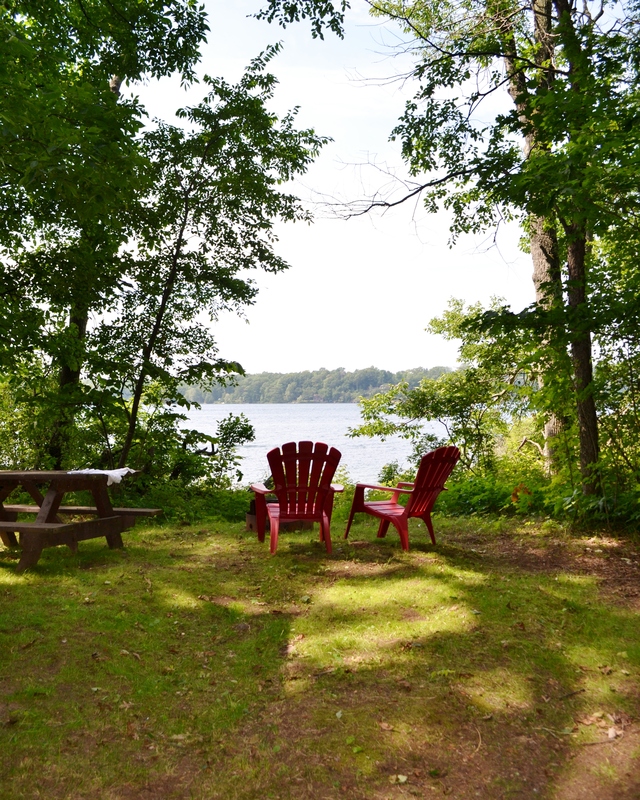 There is a lovely covered outdoor eating area, adirondak chairs, fire pit and wood fuel bbq for cooking up tasty meals. The most impressive feature though, is the setting amongst the trees, no neighbours in sight and the water laid out in front just tempting one more dip and one more paddle. 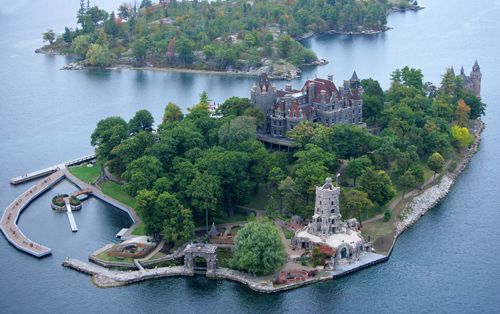 We didn’t complete the quest to find the castle, but rest assured there is one on one of the thousand islands. It’s just an excuse to go back and go back we will. We have found a place that we not only want to visit again, but maybe one that we’d like to make a more permanent situation. Dreamy? yes. A fairy tale? Happily ever after remains to be seen, but it’s looking pretty good to this princess. At least once a year we plan a “vacation” trip rather than an epic adventure. What is the difference you ask? Comfort and fun. 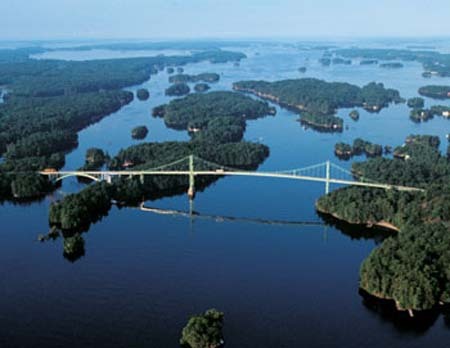 This year’s trip is to the Thousand Islands National Park. This will be our first visit and we are doing it up in style. We’re going to be staying in the parks newly offered oTENTik accommodations on McDonald Island. 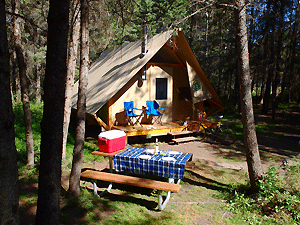 If you’ve never seen an oTENTik, it is half tent, half rustic cabin and all comfort. No sleeping on the ground, we’ll be in comfy bunk beds and eating at a table! It’s the perfect base for day paddles amongst the islands. Because this is our first family kayak trip and we have very little experience kayaking, we are looking to the expertise of the crew at 1000 Islands Kayaking to show us the ropes. 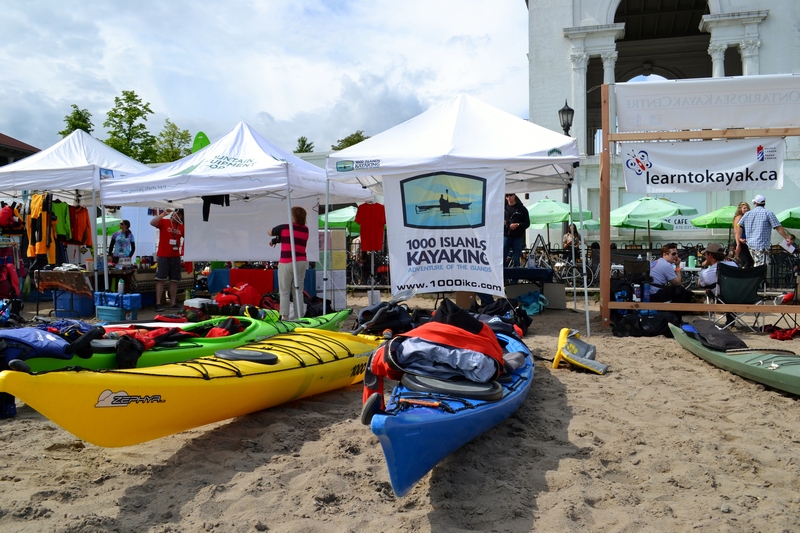 We first met the gang from 1000 Islands Kayaking at the Toronto MEC Paddlefest and they are super skilled (and certified) and equally friendly and fun. They run a number of courses, classes and tours and we’ll be visiting them at their headquarters in Gananoque. 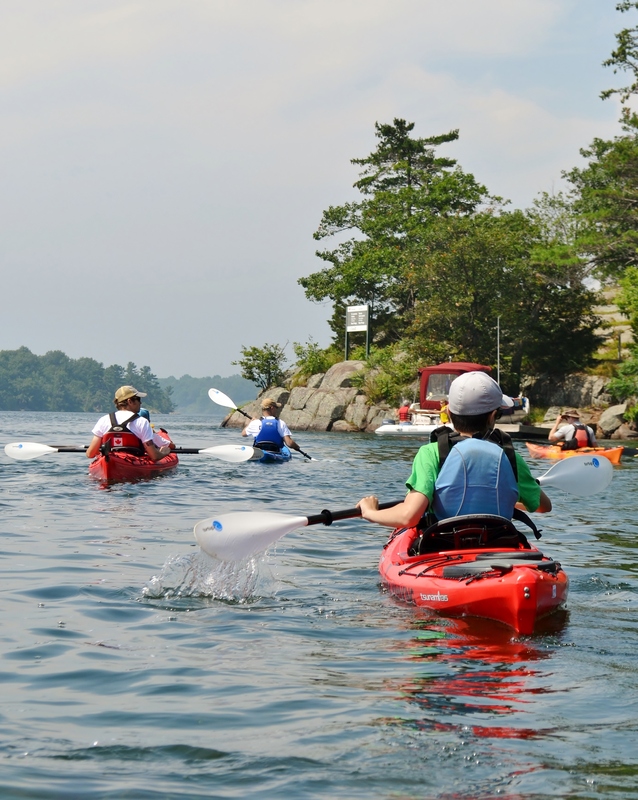 The plan is to get schooled on the ins and outs of kayaking and then hit the beautiful waters of Frontenac Arch Biosphere Reserve. We don’t even have to tote our gear around with us as they are going to shuttle it over to our campsite for us. This allows us to bring any luxury items that we would usually leave at home. 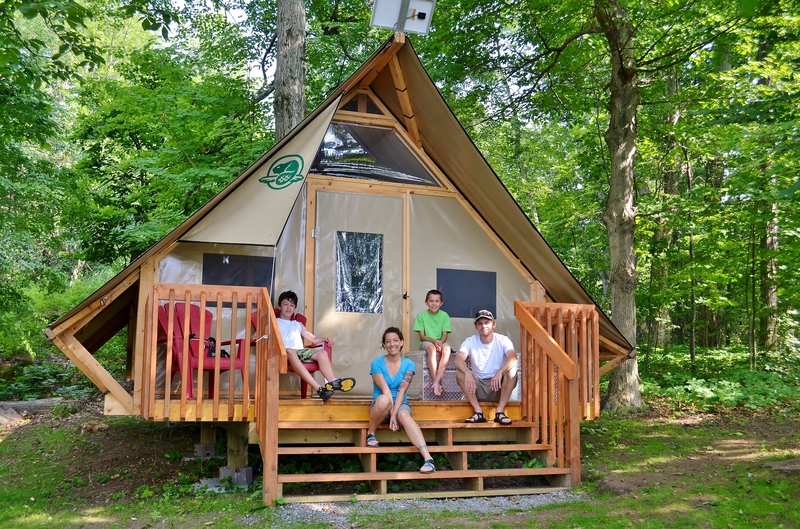 It’s a perfect service for a comfy get-away and especially helpful for family camping. After a morning of exploring, get this, we land on one of the parks islands to enjoy time on our own while our guide prepares a gourmet lunch with ingredients sourced from within 100 miles of our location! Paddling really doesn’t get more indulgent than that! The rest of our trip to the park will be spent further touring the Thousand Islands by kayak. There is no end to the wonders to be found…sunken ships, castles and wildlife galore. When we tire of paddling (is that even possible? 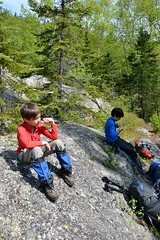 ), there are tons of hiking trails for a different perspective. 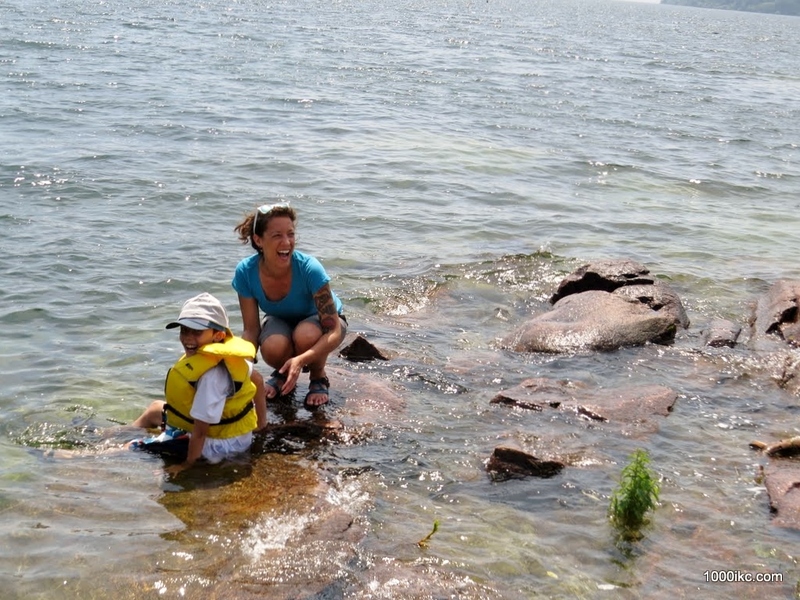 Fishing, geocaching, bird watching, scuba diving, swimming, interpretive programs and the Xplorers program for the kiddies, it’s like a natural and cultural wonderland. We can’t wait to visit this gorgeous part of Ontario and have a relaxing vacation in what is sure to be one of our new favourite parks. Cross your fingers for us that we get good weather and you know that I’m going to have my camera ready, so stay tuned for post-trip pictures. This past Saturday I grabbed the kids and headed over to the Outdoor Adventure Show here in Toronto. What an inspiring day! Our first stop was to watch a presentation by Lyn Elliott on the Top Ten Adventures in Ontario’s National Parks. Loved it! While I proudly thought to myself, “done that, done that”, there were a number of things that have been added to my “must do” list…namely visiting the St. Lawrence Islands National Park. 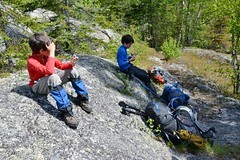 The kids took one look at the new oTENTik accommodations that are being offered and their eyes lit up. If you haven’t seen one, picture a soft sided rustic cabin. Truth be told, after our amazing trip to Georgian Bay Islands last year and the cozy cabin we stayed in there, it wasn’t a hard sell to get me to agree that we must go and try an oTENTik…and soon! As we made our way up and down the aisles of the show, I picked up maps and planners for all sorts of dreamy places, the kind of places that I’ve pictured exploring since I was a kid. Gros Morne National Park out in Newfoundland looks absolutely gorgeous and I guarantee we’ll make it there some day. But the most intriguing and bucket list worthy destinations (because of distance and exotic local) are the National Parks in Northern Canada. Wild, breathtaking and untouched, the Yukon, NWT and Nunavut seem so out of reach to the average “southern Canadian”. Getting there is possible though if we put our minds to it. With some planning, saving and training, Fraser and I have every intention of making it there with the kids. In the meanwhile, there are oodles of fabulous places in my beloved Ontario that are calling out to me. I walked away with an Ontario Parks Guide and a pamphlet listing the National Parks Historic Sites and Marine Conservation Areas here. Now I’ve got a couple more maps for the house and we can start checking off all of the places that we’ve visited. The show was a great way to spend a day and inspiration for how to spend a lifetime. And to that woman who looked skeptical that I was going to run out and buy that yogurt after she gave me a sample…I did. It was good yogurt. Reeeally good. Thanks for another great show!